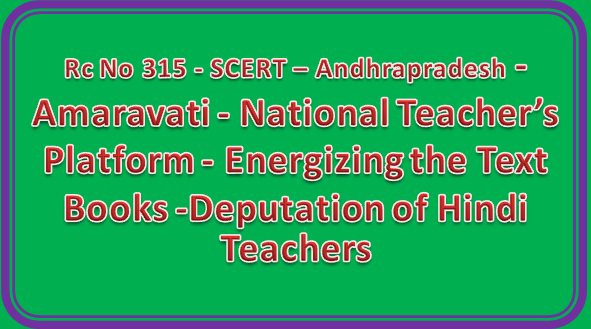 Sub: SCERT - Andhra Pradesh - Amaravali - National Teacher’s Platform. Andhra Pradesh - Energizing the Text Books -Deputation of Hindi Teachers - Orders — Issued Regarding. NCTE is working to build the National Teacher Platform(NTP) an open source shared technology infa structure to better serve over 10 million educators-all teachers in schools, teacher educators and student teachers in Teacher Education Institutions. NCTE believes that States have a huge role to play and a strong centre-state partnership is crucial for this mission. For this mission. [T cell. Commissioner of School Education. AP. Amaravati informed SCERT to organize a workshop on Energizing Hindi Text books Class VI to X, from 23-10-2017 to 25.10.2017 at SCERT, Ibrahimpatnam, Amaravati. Hence the District Educational Officers are requested to depute the identified Hindi Teachers (list annexed) of concerned district to the workshop with instructions to report to Director, SCERT,AP, Amaravati at 9.00 A.M on 23.10.2017. The TA & DA will be paid according to the APTA norms. The list of participants is annexed.